This issue explores the question „What does it mean to be human?“ An expansive topic, but a crucial question regarding the rapidly shifting landscape of our cultural geography, and the contemporary lenses of perception. A Berlin Quarterly special report takes us inside the communities of Portuguese Gypsies (Roma) living on the wild frontier between Portugal and Spain. Writer Tiago Carrasco and photographer Daniel Costa Neves present a detailed and intimate portrait of this centuries-old microcosm surviving within contemporary Western society. Editor Jeff Wood, engages the American artist and geographer Trevor Paglen in a feature length conversation - a thrilling ride across the history of seeing, from cave paintings to the surveillance technologies of drones and AI algorithms. Trevor Paglen inserts himself fearlessly in the circuit between our own organic eyeballs and the corporate and governmental power structures that manipulate how we see and are seen. In Drinking with Fascists, essayist Angela Dimitrakaki critically dissects an intimate encounter with the insidious reemergence of fascist psychology in Europe. Fiction by American elder-statesman John Ehle explores the earliest settling of America by the European underclass. Joanna Walsh shares two short stories narrating the absurdities of contemporary and national self-identification. And Steven Arnerich presents a Machiavellian play-script with his experimental mash-up of Tarkovsky‘s Stalker and A.A. Milne‘s Winnie-the-Pooh. Photographer Monia Lippi, painter Jorge Queiroz, and illustrator Ioannis Savvidis offer masterful perspectives on abstract perceptions of the Real. 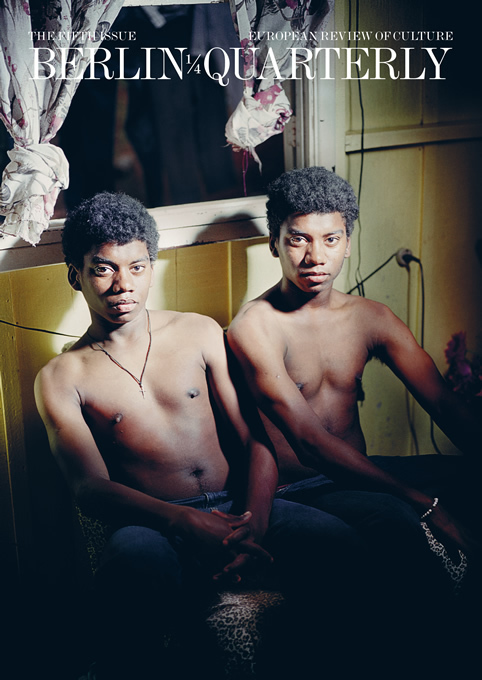 And riveting portraits of Twins by Photographer Noga Shtainer shines a light on the infamous frequency of twin births in a Brazilian village. Poetry stands out in this issue with poetry editor Ezequiel Zaidenwerg and a recommitment to considered language. Four poets are presented: from Algeria, Syria, Mexico and Portugal. And the Berlin Quarterly Archive is proud to present the cyanotypes of Anna Atkins, the first photographic images ever to accompany text.